Robert's Snow: For Cancer's Cure : Seven Impossible Things... has a full explanation, including all posts to date. The auctions start in November and continue until December. Go here to look at the artwork, and to bid once the auction goes "live." Please consider bidding on a snowflake, and letting other art lovers know about the auction and this opportunity to own a unique work of art. And now, on to the featured artist of the day! Paul Brewer has illustrated everything from chapter books to picture books. An assortment of his works can be found here. If you want to look at more of his artwork, here is an online gallery. Here is Paul's snowflake for the auction. Paul agreed to answer some questions about his work and his and his snowflake. Liz B:What children's book or children's book illustrator has most inspired you? Paul: I was not a big reader as a child (I preferred doodling over reading) but do remember being drawn to the Dr. Seuss and Babar the Elephant books in particular. The illustrators that influence me the most these days are David Shannon, Henrik Drescher, David Diaz, Kathy Hewitt, Boris Kulikov, just to name a few. Their styles are all different, but they each have something in their art that helps to influence the direction I would like to see my work go in. Looking closely at other people's art to see exactly how they achieved the end result has always been huge in helping me to create my own style. Paul: I heard about Robert's Snow a couple of years ago and even followed the eBay auction they had to sell all the snowflakes. I thought it was a brilliant way to help out a charity, plus the opportunity to own an original piece of art from a children's book illustrator. A few months ago Grace Lin and Lauren Nash, from Robert's Snow, sent out a mass email to illustrators asking if we would like to be involved with the project. I said yes, and painted my "very cool" snowflake. Paul: Two things. I am the illustrator for Barbara Seuling's "Robert series" of chapter books published by Cricket Books in hardcover (11 titles), and in paperback by Scholastic (20 titles). The first book was "Oh No, It's Robert" followed by many others; "Robert and the Attack of the Giant Tarantula," "Robert and the Great Pepperoni," "Robert and the Happy Endings," "Robert and the Practical Jokes," to name a few. I have also written and illustrated three joke books for kids over the last ten years. My first was "The Grossest Joke Book Ever" followed by "You Must Be Joking!" 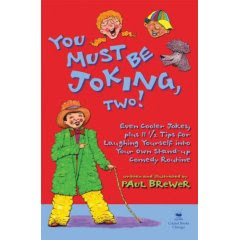 and the newly released sequel "You Must Be Joking, Two!" So my snowflake has Robert Dorfman and his friends from the series, laughing around a joke book. These are the two things that inspired my snowflake, which is appropriately titled "Joking Around." Liz B: Could you tell us something about your most recent books, You Must Be Joking, Two and Robert Goes To Camp? Comedy Routine. It has 239 jokes (I just counted!) in it, plus the tips chapter for kids who might want to learn to tell a bunch of jokes (with the help of the first book You Must Be Joking! Lots of Cool Jokes, Plus 17-1/2 Tips for Remembering, Telling, and Making Up Your Own Jokes) and then put on a stand-up comedy show at home or at the school talent show or wherever they want. In other words, basic training for kids on how to be funny. It was just released last month. Robert Goes to Camp is the final book (just released) in the Robert series. This one has Robert off to summer day camp where he meets Zach, a prankster who proceeds to get Robert into trouble. He and his friend, Lester, get sprayed by a skunk, and Lester saves Robert from nearly drowning in a swimming pool. Robert Dorfman is always getting himself in some kind of fix, but almost always in a humorous way. I know I can relate to the problems Robert gets himself into, and I think many young readers can too. I love illustrating funny stories, and Barbara's are brilliant. This series began in 1999, and I will definitely miss working on it. Liz B: What is your "pop culture" area of expertise? Paul: As for pop culture, my two greatest interests are music and humor. My wife and I continually listen to a broad range of music from several sound sources around the house. Funny books (I have a big collection of joke books in one of our bathrooms, along with a bunch of humorous toilet related stuff) funny movies and funny TV shows are a big hit around here, as well. Next year they intersect in my new book, "Fartiste," about a famous French performance artist whose specialty was farting tunes - co-written with my wife Kathleen Krull, illustrated by Boris Kulikov and published by Simon & Schuster. Boris Kulikov will be illustrating a book about farting? Well, you learn something new every day. Thanks for the feature, Liz, and for all of your great features.